We offer wide range of Karam Safety Goggles & safety eye wears, which is made from quality material such as latex ensuring long working life and protection from dust and fumes. 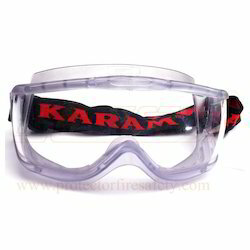 These Karam Safety Goggles are offered in various designs, colors and styles as per the demand of our clients. We are dealing Karam Safety Goggles in Delhi (NCR), all cities of Uttar Pradesh like Ghaziabad, Noida, Greater Noida, Gautam Budh Nagar, Meerut, Moradadbad, Bareilly, Aligarh, Agra, Bulandshahar, Kanpur, Lucknow, Unnao, Banaras / Varansasi, Allahabad, Lucknow, Gorakhpur, cities of Haryana, Faridabad, Bahadurgarh, Gurgaon, Ambala, Sonipat, Panipat, Cities of Uttrakhand / Uttranchal like Dehradun, Roorkee, Haridwar, Rudarpur, Ramnagar, Haldwani, Nanital, Mussorie, Cities of Bihar like, Patna, Darbanga, Bhagalpur, Begusarai, Motihari, Siwan, Gaya, Mokama, Jamalpur, Purnia, cities of Jharkhand like, Ranchi, Ramgarh, Jamshedpur / TATA nagar, Dhanbad, Bokaro, Deoghar, Medininagar, Phusro, Dumkar, Hazaribagh, Gumla, Gomia, Cities of Rajasthan like, Jaipur, Alwar, Bhiwadi, Neemrana, Udaipur, Jaisalmer, Cities of Punjab like, Chandigarh, Ludhiyana, Amritsar, Ambala, Cities of Madhya Pradesh like, Gwalior, Indore, Bhopal, Etc. We offer an exhaustive scope of Karam Safety Goggles ES-005 for assurance of eyes and clear vision of the wearer. These wellbeing goggles are manufactured from quality crude material guarantees security from destructive dust or fluid particles, vapour and radiations. Clear hard coated polycarbonate for wide coverage. Light weight dual base & wrap around lens. Clear inbuilt nose bridge gives comfort. Polycarbonate temples with side shield. We are instrumental in giving a refined scope of Karam Safety Goggles ES-015 "ce Marked En 166:2001" to our esteemed patrons.This item not just give security against flying trash and substance sprinkles however might likewise ensure against noticeable and close unmistakable light or radiation from UV beams. Polycarbonate material used for frame. Soft pvc nose pad gives comfort. packaging : single’s in bag. 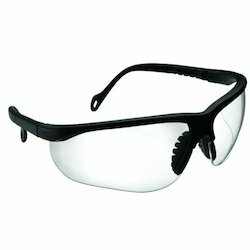 Karam Safety Goggles ES-010 guarantees the complete insurance for eyes of the client. Wellbeing goggles likewise give clear vision amid the work which empowers the clients to finish their errands with most extreme accuracy. 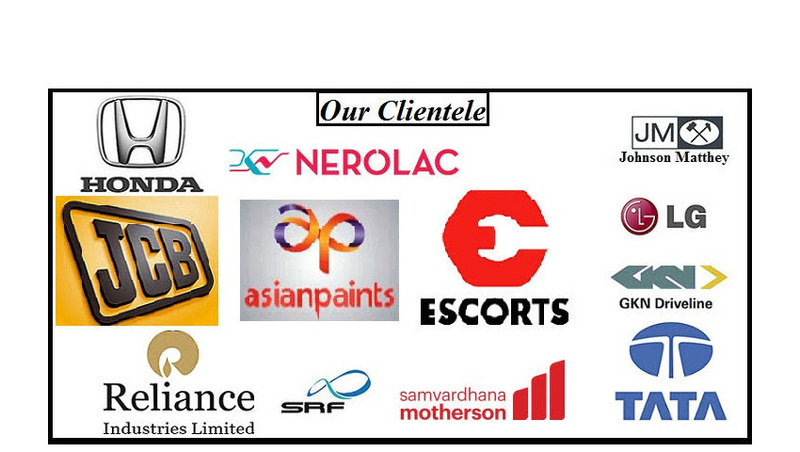 This is planned with high exactness keeping in mind the end goal to meet the universal quality norms. Aside from that, our group of value specialists tests every item before conveying to the customers so as to guarantee their perfection. Weight : below 70 gms. We offer an exhaustive scope of Karam Safety Goggles ES-001 for assurance of eyes and clear vision of the wearer. These wellbeing goggles are manufactured from quality crude material guarantees security from destructive dust or fluid particles, vapour and radiations. Made with polycarbonate, Safety Spectacle ES001 offers lighter, exceptional Impact Splash protection with excellent vision. An Ultra light weight model and equipped with a flexible frame which virtually ensures a close snug fit on both large and small dusts, the ES 001 offers the highest level of eye protection against high speed particles. Construction sites; areas where sand and large dust particles are blowing at high speed. Extremely light weight, weighing only about 26 gms, thus providing extreme comfort. Wrap-around design for better coverage. We offer an exhaustive scope of Karam Safety Goggles ES-003 for assurance of eyes and clear vision of the wearer. 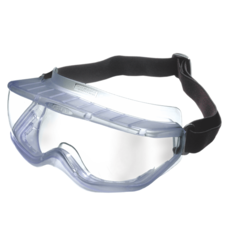 These wellbeing goggles are manufactured from quality crude material guarantees security from destructive dust or fluid particles, vapour and radiations. Containing all the inherent design, sporty and comfort features of the ES 003 has an additional protective quality to offer. 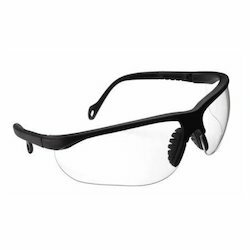 It is fitted with a special IR-5 lens, making it an ideal choice for protection to the eyes during gas welding operations. Areas where there is molten metal; furnaces, etc. Polycarbonate lens integrating the side-shields for perfect protection. Temple grips equipped with soft cushioning pads, making it more comfortable for all day use. Adjustable temple length to customize fit on the user's head. Length adjustable within a range of 13mm. Temple/ Side Arms capable of tilting within a wide angle range (upto 60 degree) there by adjusting to provide the best possible fit. We offer an exhaustive scope of Karam Safety Goggles ES-004 for assurance of eyes and clear vision of the wearer. These wellbeing goggles are manufactured from quality crude material guarantees security from destructive dust or fluid particles, vapour and radiations. Equipped with a special IR-11 lens and a broad, soft PVC body which provides the wearer a wider protective sealing area, the ES 004 is an ideal choice for a variety of electric arc welders. It has a wide soft PVC body which provides the wearer excellent comfort. 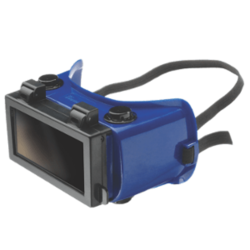 It is provided with a flip-up lens window to enable clear vision during those times while welding operation is not in progress. It is provided with Six Indirect Ventilation Caps two on top, two in bottom and one each in sides. It has a fully adjustable elastic head- band for a snug fit. Comes with Lens Replaceable feature. We offer an exhaustive scope of Karam Safety Goggles ES-008 for assurance of eyes and clear vision of the wearer. These wellbeing goggles are manufactured from quality crude material guarantees security from destructive dust or fluid particles, vapour and radiations. Providing fail-proof protection against liquid and chemical splashes, the ES 008 comes with a unique wrap-around design and a specialized anti- fog lens. Areas exposed to splashes of chemicals. It has a soft and wide PVC casing around the rim to ensure 100% sealing of the eyes against chemical and liquid splashes. It is provided with indirect ventilation slits on both the top and the bottom parts of the rim to allow for air circulation. We offer an exhaustive scope of Karam Safety Goggles ES-013 for assurance of eyes and clear vision of the wearer. 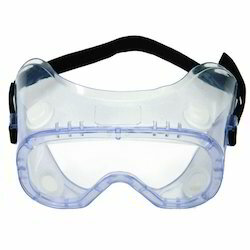 These wellbeing goggles are manufactured from quality crude material guarantees security from destructive dust or fluid particles, vapour and radiations. 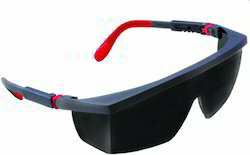 Specially designed smart fashionable Safety Spectacles... a perfect choice for both men women. Industrial, Construction sites in the areas where sand large dust particles are blowing at high speed. Light weight Spectacles, which resembles sunglasses provides long lasting comfort to the user. Close-fitting, unitary front with dual I/O base curved lens offers wide and unobstructed vision. Dual-material temples for comfortable fit. Soft nosepiece; universal snug fit.